EcoAquarium Frogs – Now you can get your own! For several years now, we have sold the EcoAquarium Dwarf African Aquatic Frogs in our store. They are delightful to watch and easy to maintain since they need to be fed only twice a week and have their tank cleaned twice a year. A recent flurry of solar activity resulted in the Northern Lights coming much further south than they usually are. I know of several folks who went out to dark skies to try and view them but almost all were disappointed. With this event we had several comments of ‘Why didn’t they know about this sooner! !’ along with “Why didn’t I see anything! ?” although most folks just accepted it. Nevertheless we feel some obligation to inform people as to why predicting the Northern Lights isn’t the same as predicting a Solar Eclipse. The short answer is that we simply cannot predict the Northern Lights very well because we can’t predict events on the surface of the sun very well. 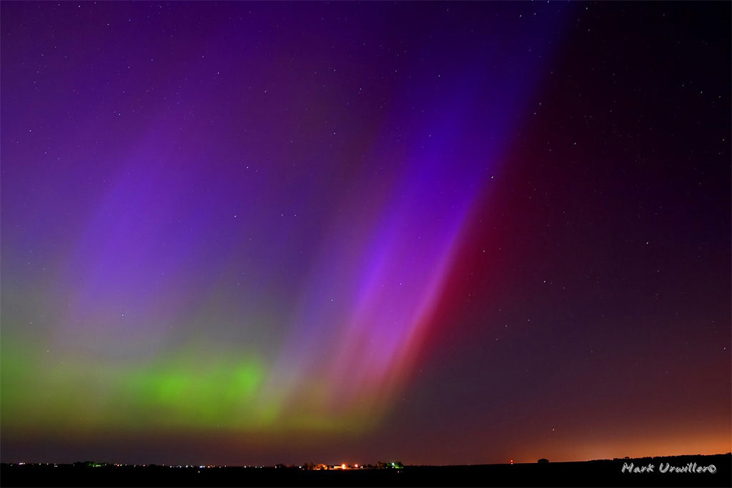 The Northern Lights are actually collisions between particles in our atmosphere vs. charged particles from the sun. The colors depend on what elements in the atmosphere is being charged by those solar particles. The problem becomes: “when does the sun emit those particles?”. The answer is that it always emits them, but occasionally it emits more. Sadly, predicting Aurora Borealis is nowhere even remotely close to being an exact science. While Lunar Eclipses can be predicted with precisions several thousand years in advance ( and probably more) Auroras tend to be a bit more…finicky. Other conditions do apply – one must have dark skies to have a hope a viewing them as city lights will wash them out. Furthermore, just having the right conditions is not a promise of great Northern Lights -many meteor showers that are predicted to be great viewing have turned out to be flops. Certain elements of astronomy simply are not predictable with our present technology: the visibility of comets making their approach to Earth, the strength of a meteor shower, and, of course, the visibility of Northern Lights. If you do want to see Northern Lights your best bet is to go North. The shows get better and better as you head towards the Arctic Circle. Also be sure to keep an eye on NASA’s Kp index , which tries to predict the particle’s levels for the future 3 days. More is better. And of course, go during a sunspot cycle peak. We are actually coming down off a cycle and so visible lights will become rarer. The recent Aurora appearance down south was actually something of a fluke.